The GE Osmonics Desal AG-Series family of proprietary thin-film reverse osmosis membrane is characterized by high flux and high sodium chloride rejection. 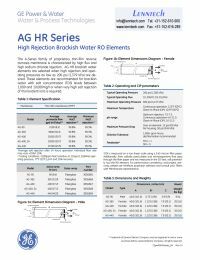 AG HR brackish water elements are selected when high rejection and operating pressures as low as 200 psi (1,379 kPa) are desired. These elements are recommended for brackish water with salt concentration (TDS) levels between 1,000 and 10,000mg/l or when very high salt rejection of monovalent ions is required.